Every body needs blood pressure to live. Without blood pressure, blood would not be able to circulate through the body to carry oxygen and fuel (calories) to vital organs. Blood pressure is the force of our blood pushing against the walls of our arteries. Each time our heart beats, it pumps out blood into the arteries. Our blood pressure is highest when our heart beats, pumping the blood. This is called systolic pressure. When our heart is at rest, between beats, our blood pressure falls. This is called diastolic pressure. But there is always a certain amount of pressure in the arteries. Hypertension is the medical term used to describe high blood pressure. High blood pressure is a common condition in which the force of the blood against our artery walls is high enough that it may eventually cause health problems, such as heart (cardiac) disease, kidney (renal) disease, hardening of the arteries (atherosclerosis or arteriosclerosis) and eye damage. These complications of hypertension are often referred to as end-organ damage because damage to these organs is the end result of chronic (long duration) high blood pressure. For that reason, the diagnosis of high blood pressure is important so efforts can be made to normalize blood pressure and prevent complications. The symptoms of hypertension include headaches, fatigue, dizziness, ringing in the ears and frequent nosebleeds. But not all people experience these. 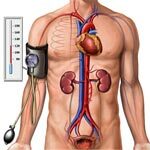 We can have high blood pressure (hypertension) for years without any symptoms. That's why high blood pressure is often called "the silent killer." Though a person may not have any symptoms, it doesn't mean that the high blood pressure is not affecting the body. Uncontrolled high blood pressure increases our risk of serious health problems, including heart attack and stroke. High blood pressure typically develops over many years and it affects nearly everyone eventually. Fortunately, high blood pressure can be easily detected. And once you know you have high blood pressure, you can work with your doctor to control it. Most of the time, high blood pressure can be controlled with medicine and lifestyle changes. One or both of these numbers (systolic pressure or diastolic pressure) can be too high. If you have pre-hypertension, you are more likely to develop high blood pressure. Blood pressure is measured with a small, portable instrument called a blood pressure cuff or sphygmomanometer (Sphygmo is Greek for pulse, and a manometer measures pressure). A cuff is wrapped around a person's upper arm and pumped up to create pressure. When the cuff is inflated, it compresses (squeezes on) a large artery in the arm, stopping the blood flow for a moment. Blood pressure is measured as air is gradually let out of the cuff, which allows blood to begin to flow through the artery again when the blood pressure in the artery is greater than the pressure in the cuff. As we get older more likely our blood pressure is also become too high. This is because our blood vessels become stiffer as we grow older. High blood pressure increases our chance of having a stroke (brain damage), heart attack, heart failure, kidney disease and early death. How can we prevent High Blood Pressure (Hypertension)? Maintain a normal weight for your height. Exercise regularly. This can help prevent you from becoming overweight or help you in losing pounds if you need to. Exercise also helps keep your heart and blood vessels strong and healthy. Eat a healthy diet that includes mostly whole grains, low-fat dairy products, fruits and vegetables. Don't smoke cigarettes or use any tobacco product. Smoking and high blood pressure are major risk factors for having a heart attack or stroke later in life. Keep your stress levels in check. It may help to practice relaxation techniques such as deep breathing exercises or biofeedback. Decrease your sodium (salt) intake. Consuming less sodium has been proven to help lower blood pressure in some people and may prevent some from developing high blood pressure in the first place. Salt is often found in breads, baked goods, and other processed/canned foods. Stop drinking alcohol, which is associated with high blood pressure. Know your blood pressure. Have it checked regularly - although high blood pressure is more common in adults, it can occur at any age. Why does diet and food affect your Blood Pressures? Are you aware that what you eat can affect your blood pressure? Watching your diet can be very beneficial to keeping your blood pressure normal. Even if you have never had a problem with high blood pressure, taking necessary precautions can be beneficial. You could try a Vegetarian diet. In this diet you will get many of the following: Calcium, Magnesium, Vitamin A & C, Potassium, Complex Carbohydrates and Polyunsaturated Fat Fiber. All of these can have a great influence on your blood pressure. Sugar can increase your blood pressure, especially the common table sugar sucrose. Try to limit your intake of this. A diet high in fiber has been proven effective in lowering blood pressure. Along with lowering your blood pressure this diet will also help you reduce your cholesterol levels and even promote weight loss. Eating plenty of fruits and vegetables is very important as well. Any diet that includes consuming fruits, vegetables, low-fat dairy foods and is low in total fat, cholesterol and saturated fat has proven to be effective in lowering blood pressure. Many people use more salt than they are aware of. Maybe because some of us are just used to automatically salting our food unaware if it was salted when being cooked. (If eating out) Reducing your salt intake will also help lower your blood pressure. A diet high in potassium and low in sodium reduces your blood pressure rise by reducing the effect of adrenaline. If you reduce your sodium intake you must also increase your potassium intake. There are some vegetables and spices that help control your blood pressure. Many of these are very common vegetables and spices so you may be helping your blood pressure and not even know it. Onions' essential oil is very beneficial. If you have two to three tablespoons of this essential onion oil a day, it could help reduce your systolic levels. Tomatoes are also a beneficiary to controlling blood pressure. They are high in GABA, a compound that helps lower your blood pressure. Broccoli contains several blood pressure reducing ingredients. Carrots also have many compounds that do the same. Introducing these vegetables to your diet will do wonders for your blood pressure. Even if you don't suffer from high blood pressure, it's best to keep it at a safe level and take the extra precautions to get there. Garlic and celery are also great to add to your diet. Garlic is good for the heart which you've probably been told before. Eating just one clove of garlic a day has been proven to be beneficial. Whatever diet you choose or whatever foods you try to limit, remember you are doing it for your health. Many people learn to enjoy healthier foods as they get older. If you have any questions or concerns about your blood pressure get with your doctor. They will be happy to assist you and answer any questions you might have. Taking care of your health is very important and will make you feel much better.